An Opal Diamond ring for men or women with two very bright Opals and nine Diamond accents in 14k Gold. 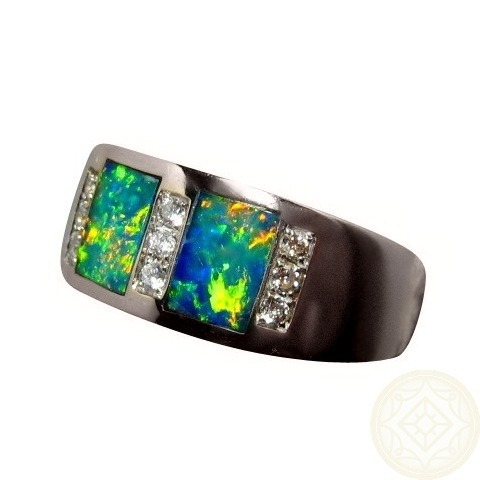 An Opal ring in a design that men or women can wear. 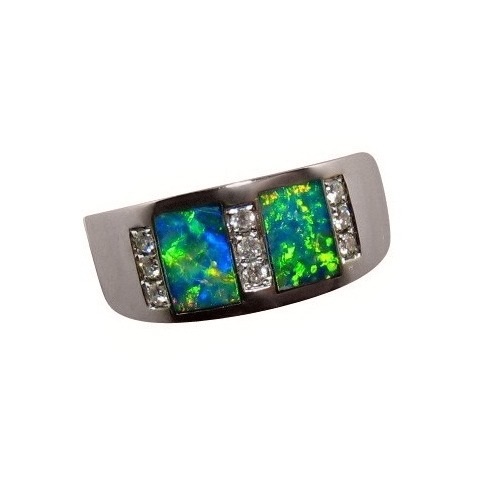 The 14k Gold band is 8 mm wide and is inlaid with two extremely bright Green and Gold Opals in a very lively play of color and is accented with three bright white Diamonds on either side of the Opals for a total of nine Diamonds each measuring 1.7 mm round. A quality ring that is Made to Order in your choice of Gold color and ring size which will take about 14-21days to make before photos are provided for your approval to ship. I received the ring. It is beautiful. Thank you!